Kids Temperature Science Experiment - What makes a good insulator? What is a good Insulator? Air is a good insulator as it does not let heat pass through it very easily. The air can be trapped to form a layer of insulation. This insulation can then prevent heat from moving into an object as well as preventing heat moving out of an object. 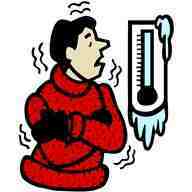 Some examples of trapped air as an insulator are; a thermos, polystyrene cup, oven mittens, double glazed windows. Bird keep warm from their feather and some animals' fur keep then warm. This is due to air being trapped between the feathers or hairs and acts as an insulator. For our experiment a good insulator is a kind of material which keeps things warm for longer, it helps to stop heat from escaping. Which material do you think would make the best insulator? Foil, cotton cloth, newspaper or a woollen sock? This experiment will help you find out which materials make the best insulators. 1. Align the four jars in a row on an even surface. 2. Pour the same amount of very hot water into each jar/mug. NOTE: If you are using a kettle to heat the water please make sure an adult helps with this experiment. 4. Secure the materials over the top of each mug/jar with a rubber band. 5. Leave the jars/mugs for half and hour. 6. Remove all the covers/materials from the jars/mugs. 7. Feel the water in each of the jars/mugs to see which one is the warmest. The one which has the warmest water had the best insulator as a cover.